When playing an instrument with strings, there’s a 100% chance you’ll need to change them eventually. 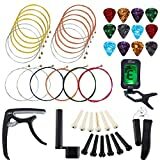 There are various examples of alternate string changing techniques, such as that used on a Floyd rose setup, or on a nylon strung acoustic, but I’ll focus on traditional, common approaches with electric and acoustic guitars. If you need to change your strings, then look no further! Firstly, get your guitar and balance the neck. Trying to hold your guitar as if you’re playing it would be reductive as you’ll just end up crossing your arms over and stretching out needlessly. Either get a specific piece of equipment, or simply rest it against the arm of a chair etc. Then you’ll want to gather your tools and make sure you can keep an eye on them. Some of them are particularly small, so could roll away if you don’t look after them. You may or may not need a tuner (How To Tune A Guitar/Best Guitar Tuner), but you’ll definitely need a wire cutter and a string winder. Your string choices are down to you. When you start to restring the acoustic guitar, you’ll need to start by unwinding the string tension completely. Make sure you feel the string becoming more slack, rather than tighter. If you accidentally start tightening the strings, you’ll be able to feel it getting harder to turn (and if they snap it might hurt… a lot) but if you’re going the right way it’ll get looser an easier. When the strings are loose, you’ll be able to unwind them from the post it is usually tied around. Do this for each string and they’ll almost be out of the guitar. Remove the bridge pins by using the string winder to twist them until loose. Then you’ll be able to pull the strings out from the bridge and they can be discarded. Be careful though, because they’ll still be sharp at each end. Clean! This is a key step you should be careful to remember, as your frets are probably full of dirt. Get some fret cleaner and use a cloth to gently get all the build-up off of the frets. This will make your tone even nicer when you restring the guitar, but will generally keep your hands a lot cleaner. Take your first string (low E) and place it through the now open bridge hole. As you do this, place the bridge pin in alongside the string and pull on it with the hand you’re holding it with. This will tighten the string. Then place the other end of the string through the hole in the tuning post. Once it is a few inches through, begin to twist the tuning peg so that the string starts to tighten. It will begin to get stiffer as it becomes closer to the fretboard. Don’t focus on tuning specifically yet. Repeat steps 7 and 8 for the rest of your strings, working from low to high. This will mean you don’t have to cross over or get in the way of yourself when tuning. Get some wire cutters and cut the excess strings off the top of your guitar. If you leave them on, you’ll literally have bits of jangly wire near your eyes if you don’t. Tune your guitar. Whether it’s through your tuner or your trained ear, make sure you tune your guitar strings properly. No matter how good your newly set up guitar is, if its isn’t in tune it isn’t going to sound good. Then you’ll want to gather your tools and make sure you can keep an eye on them. Some of them are particularly small, so could roll away if you don’t look after them. 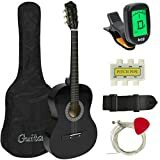 You may or may not need a tuner (How To Tune A Guitar/Best Guitar Tuner), but you’ll definitely need a wire cutter and a string winder. Your string choices are down to you, but our guide to the Best Electric Guitar Strings might help you out. Then begin to loosen the slack of your strings by turning the tuning pegs to a position where the strings start to loosen. However, don’t take them all the way down this time, like you would with an acoustic guitar, and instead prepare to use wire cutters to cut the strings. Do this around the neck pickup and make sure the string is loose enough to not spring up. Repeat this for each string, and then remove them by pushing the strings through the bridge and untying them from the tuning posts. Then thread the new strings into your guitar. This is where things can alternate based on the type of guitar you own. In a Fender-style guitar, you’ll want to thread the strings at the body end through the tremolo cavity, while in a Gibson-style guitar you’ll want to push it through the tailpiece underneath the body. Make sure you’re aware of your own type of guitar so you approach this correctly- it’s pretty important. Make sure your tuning post holes line up with the neck of your guitar. To do this, thread your strings through and then turn the pegs until they line up. Pull the strings through a few inches, and make sure you bring enough through to wind around the post. This will begin to tighten the strings in preparation for tuning. Twist the string around the tuning post. Make sure it is tight as it circles the post, we don’t want any crinkles, turning it smoothly in a clockwise motion. When it is tight and in place around the post, without having too much string wrapped round (you’ll be able to tell) you can move to step 9. This one is a bit hard to understand. Try and take the twisting shape you’ve made with the bit of string that has gone through the post, and slide the string between the nut and the post. This means to put it through the ‘hole’ you’ve created with the string, a bit like you’re tying a knot with the excess string. Once you’ve done this, you can tighten the knot so that gives an extra layer of security, tightening the string around the post every further. Then you can simply twist the tuning pegs until the strings are tight. Again, don’t worry about specific tuning yet but make sure the direction in which you’re turning the string is making the string tighter, not looser. Repeat steps 7, 8, 9 and 10 for the rest of your strings, working from low to high. This will mean you don’t have to cross over or get in the way of yourself when tuning. As you begin to properly tune your strings, make sure you press down on the 5th fret in order to stretch the strings. Repeat this until the strings don’t stretch anymore. Get some wire cutters and cut the excess strings off the top of your guitar. If you leave them on, you’ll literally have bits of jangly wire near your eyes if you don’t. The reason you should leave these on is because you aren’t sure yet quite how tight you’re going to need to make the strings. Make sure to cut the wires. These can be dangerous to leave on. Make sure not to over tune. If you tighten the strings too much, you’ll end up snapping them. Replace your strings twice a year. In general, this is a good idea as it’ll improve the sound of your guitar. However, use your own judgement if you think you play more or less than this. Be prepared for a little bit of a crossover period. For a while, your strings will be looser than normal, and a little more prone to going out of tune. Either be prepared to do a lot of tuning during this time, or avoid playing gigs etc. if you want to avoid this effecting your playing. Be aware of different types of guitars. If you have a Floyd rose, for example, you’ll need to take a slightly different approach.